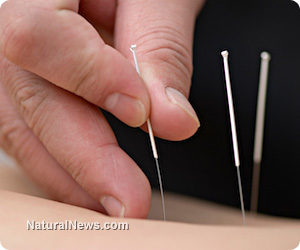 (NaturalNews) If you or someone you know suffers from moderate to severe depression, counseling and acupuncture could be your answers to finding real relief. A new study recently published in the open-access journal PLOS ONE found that acupuncture is at least equally as effective as counseling at treating depression symptoms and that acupuncture in particular can lead to a nearly 50 percent reduction on the depression scale in just three months. To arrive at this conclusion, Hugh MacPherson and his colleagues from the University of York in the U.K. evaluated 755 patients with moderate to severe depression. According to Reuters, 302 of these patients were randomly assigned to a group that received 12 weekly acupuncture sessions, while another 302 were assigned to 12 weekly counseling sessions. The remaining 151 patients received usual care, which presumably included antidepressants and other pharmaceuticals. At the beginning of the study, the average depression score among all patients was 16 on a scale from 0 to 27, with 27 representing extreme depression. A 16, according to reports, is considered to be moderately severe depression. But at the end of three months, patients in the acupuncture group experienced a significant drop on the scale from an average of 16 down to nine, which is considered to be the higher end of the mild depression category. The average depression score also dropped in the counseling group, to an average of 11, while the typical care group only dropped to about 13. Even better was the fact that the benefits of these treatments persisted, lasting an additional three months following the study's conclusion. In other words, even after the study was over, patients in the acupuncture and counseling groups continued to experience the benefits of these treatments. "For people who have depression, who have tried various medical options, who are still not getting the benefit they want, they should try acupuncture or counseling as options that are now known to be clinically effective," stated MacPherson about the incredible results. "What's more important for the patient is does it work in practice and that is the question we were asking." The study admittedly had its limitations, as roughly 70 percent of all patients had taken antidepressants in the three months before the study. Some of them also continued taking these medications during the study, and the authors did not specify which patients these were from each group. Still, the results help reinforce the notion that other treatments besides just drugs can provide formidable benefits without eliciting harmful side effects. "What this says is if you don't get completely better, there are other options," added Dr. Philip Muskin, a psychiatrist from the Columbia University Medical Center in New York who was not involved in the study, to Reuters. "One option would be to take a different medication, but by this study [acupuncture and counseling] would be valid options." Previous studies have also come to similar conclusions, including a study put out by the Cleveland Clinic's Center for Integrative Medicine earlier this summer. Researchers there found that acupuncture can be utilized apart from psychiatric drugs in the treatment of depression, and actually be used in place of them, though that particularly study looked specifically at mild to moderate depression. "What we're finding is that for these patients that are suffering from mild to moderate depression, acupuncture is just as effective as these antidepressants," stated Jamie Starkey, an acupuncturist at the clinic.